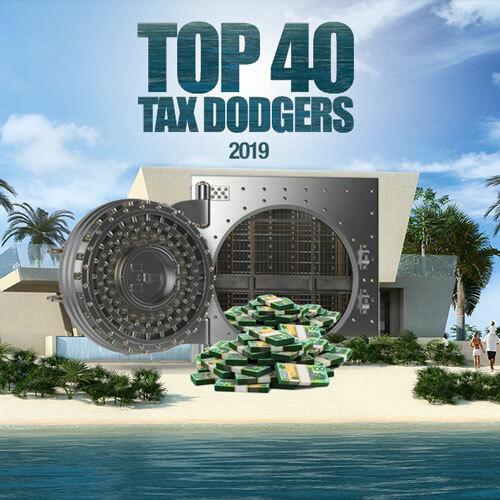 It is no small irony that this tax dodger is subject to a takeover by another tax dodger, Brookfield, whose secretive entity BPIH romped into the Top 40 this year at #32. Healthscope looks to have used up its ample supply of tax losses and the tax expense in its latest set of accounts indicates they may have to actually pay tax this year. If directors, as they have presaged, accept the $4.5 billion bid from Brookfield, it is likely that Healthscope won’t pay tax as Brookfield has notorious tax haven connections and sends billions of dollars in capital to Bermuda from the Australian assets which it controls. Healthscope owns 43 private hospitals and a suite of medical centres. It was floated on the ASX in 1994, taken private by vulture funds TPG and Carlyle in 2010. They floated it again for a large profit in 2014, only it to deliver a poor performance for ASX shareholders, and lately some attention from the Tax Office. Auditor is Deloitte. The Tax Office figures lag but Healthscope’s latest accounts record tax paid of just $15.4 million last year and $13.7 million the year before (this may be tax paid overseas). The notes also disclose that, last year, the Tax Office “completed a streamlined assurance review of Healthscope’s Australian business. The ATO has indicated that it may undertake a more detailed review in respect of various matters that relate to the pre-IPO period, and Healthscope’s utilisation in the post-IPO period of tax losses”. In other words, the Tax Office suspects Healthscope’s former owners TPG and Carlyle have been up to no good, which is no surprise.